Check out Google Earth! 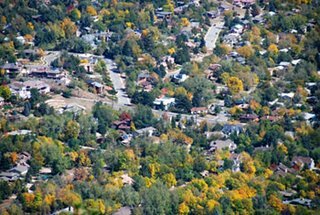 It's free and you can probably see what your house looks like from space. Not cool enough? All you gear heads can load up the KMZ course map and get a leg up on the competition. And don't forget to read up on the particulars of our insanity. At 6:00am Friday, my roommate and I geared up for a ride at Walker Ranch. Loading up the bikes in the car and piling our gear into the car took longer than we thought so no stop for coffee (bad idea). My new car has heated seats and they came in handy as the temp was in the low 50's. Walker Ranch is about a 30 min drive up Flagstaff and west into the Indian Peaks. Some crazy Boulderites do "Super Walker" which is a grueling climb up Flagstaff Rd, over the top and down to the trailhead...on a road bike it's not so bad but on a mountain bike, it makes for a long day. Since it was a work day, we opted for the drive to the trailhead. I created a placemark in Google Earth and used the Image Overlay feature, click here for a kmz file of Walker Ranch. The main trailhead is closed for construction so we started at a different point in the loop called "Ethel Harrold Lot." I use TrailCentral.com for local trail descriptions and maps. Here's a cool page with maps, kml file, and GPS mapping. The ride was longer than I anticipated but that's because we stopped at the technical parts and pushed each other to clear some tricky sections, took in the views of the snow-capped peaks, and snapped lots of photos. Back at the trailhead, we agreed to make this morning ride a weekly thing but allow an extra 10 min to grab coffee on the way. 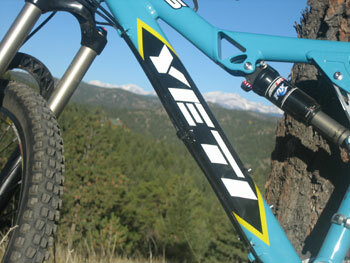 Ooooh, I forgot to mention that this was my 4th time riding on my new bike: Yeti 575 (made down the road in Golden)! 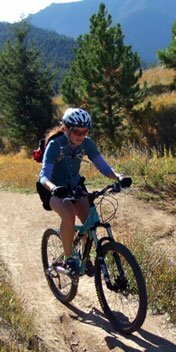 I was riding my trusty Trek 8000 (first mtn bike) and now that I'm on a full-suspension...I find myself saying things like "Weeeee" and "Wahoooo" - and the best part is now I LOVE downhill whereas before I was shy and easily sketched out on my hardtail. I found it at a great local shop, Sports Garage, and it was a demo bike for the summer, so got a screamin' deal. Now, the hard part is selling my trek. Lots of memories and miles on that bike...hopefully Craig's List will find me an owner who will love it like I did. Sniff. Sniff. congratz on the sweet new ride! Can't wait to tear it up with ya in Moab. SWEET bike! I am so very stoked for this race. En Route to a Slog Fest?